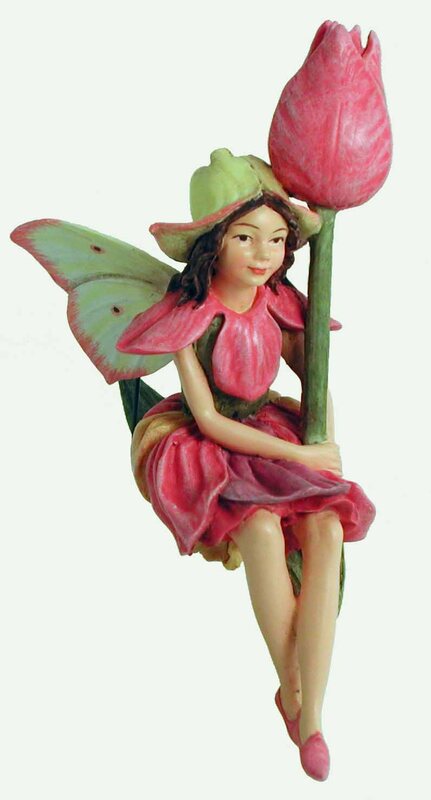 Beautifully hand painted Tulip Flower Fairy figurine. Optional gold string and wire pick included for securing in your display. Individually packaged in its own window display box that includes a biography of the artist, Cicely Mary Barker. At noon on May 11th, the Flower Fairies gather for the Spring Fling. They festoon the Tulip Fairy with crowns and garlands, posies of May flowers and wild cherry blossoms, as she stands at the centre of a grassy circle. As a chorus of robins and wrens warble a lively song, the fairies skip round the Tulip Fairy. The human tradition of dancing round a maypole derives from this fairy ceremony. See tabs below for more product information. Beautifully hand painted Tulip�Flower Fairy figurine. Optional gold string and wire pick included for securing in your display. Individually packaged in its own window display box that includes a biography of the artist, Cicely Mary Barker. Red, yellow, pink, or white. As dark as any plum. To England did we come. And Holland is its name. Aren't you glad we came? - Coat with polyurethane varnish to protect colour�from weathering. - Handle with care, will break if dropped on a hard surface. - Suitable for indoor and sheltered outdoor use. Click here for more detailed product care and general miniature gardening�information. 1. Fairy garden miniatures come in many different sizes and do not have a specific scale. Please consider the size when selecting items from different ranges to ensue they will complement each other and your miniature display. Having said that, we have seen first hand that children are not at all concerned with scale and will create magical scenes with items of all sizes. Older enthusiasts however may like to be more mindful of this. 2. Fairy ornaments and miniature accessories are not toys.�It is the responsibility of parents/guardians/carers to consider the age and stage of development of the child�and�gauge the suitability of our items, as�some�are hazardous to�young children due to�the pointed ends, sharp edges or very�small size (choking hazard).�If not handled with care or dropped on a hard surface,�they could break.�We recommend that you keep any items of concern�out of reach of young children and supervise play. 3. Most of the products on our website are handmade and/or hand painted. Images have been provided for illustrative purposes only and we do no guarantee that any image will reproduce in true colour nor that any given image will reflect or portray the full design or options relating to that product.